This home has it all! Move in ready- Entire home has been updated! Eagle Cove neighborhood in Palm Harbor, FL is much sought after for the spacious homes with lush trees and landscaping situated on a pond. 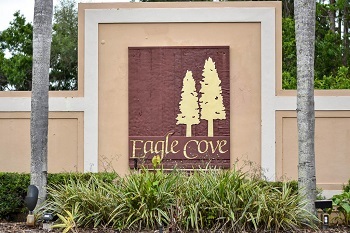 Located north of Tampa Road on East Lake Road, Eagle Cove homes for sale range in price with approximately 1950 to roughly 2700 sq. ft. and up. Many homes for sale in the well kept community have caged, heated, in ground pool and spa, central vacuum. gas appliances and hot water heater. There are deed restrictions and fees are required. Pets are allowed. The light and bright homes with cathedral/vaulted ceilings, lots of windows and walk-in closets. Three to five bedrooms with two to three baths are the norm in this neighborhood.. There is a variety of floor plans to choose from and one of them will surely fit your lifestyle. Homes are one and two story with two car garages and inside utility rooms. Walk to the Palm Harbor Public Library and Pinellas Trail. Near schools, great shops, restaurants, golf courses and the beach. This is an ideal location and a very clean and neat subdivision in Palm Harbor. One of our affordable favorites! Since the community is small, you won't find a lot of inventory at any given time. We can set up a watch for you to alert you when homes become available for sale, just ask and we will be happy to do that for you. Selling your home in Eagle Cove? If you allow us to work with you in selling your home in Eagle Cove, we will get you the best deal possible all while working efficiently and quickly. If you're considering selling in the near future, we are the right people for the job. Contact us today at 727-314-1000 or enter your information in the form below to be contacted via email.